Who you gonna call? Not the plumber. You are here: Home / Personal / topics / stories / Who you gonna call? Not the plumber. 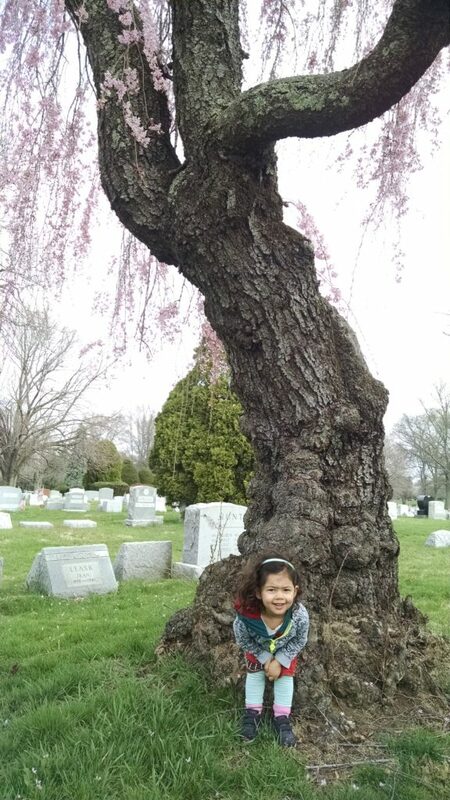 EV being an oddball while not dancing on any graves on a walk through the cemetery three months ago. What I didn’t mention when I described my uneventful call to the plumber on Friday is that it occurred in the midst of a walk with EV through our local cemetery, and that during the call I saw what E has now convinced me was a ghost. I didn’t think they were a ghosts at the time. As I was talking to our plumber, the first appeared sort of out of nowhere and began walking very briskly toward me. He was older, but not as old as my parents, and in a neon colored t-shirt shirt that seemed to indicate that in some capacity he was trying not to be hit by a car. And then… I don’t especially recall what happened. He never walked up to me or said anything. I think he smiled? EV and I were standing towards the middle of the drive walking north but I don’t remember him circling to either side to move past us to the south. But, who knows? I was trying to overcome my renters’ mentality by making arrangements for home repairs while ensuring that toddler didn’t literally dance on anyone’s grave. I’m sure I just wasn’t paying attention. Except, then we saw him again and he was with another ghost. I ended the call with the plumber and EV and and I swung west around the disused greenhouse attached to one of the cottages on the property. She wanted to “sneak up on the house” (which involves her running up a walk to try to jump off a step or touch the siding), but I saw that some of the basement windows were broken through and was trying to wrangle her back to the curbside. “Oh, hello,” the older man said as he approached us from the road to the north. I think it was the same man. He was the same age with the same leathery-skin tanned look about him, although I was sure that his neon shirt had been a different color a moment before. There was also the fact that he had been headed south at least 500 feet behind us and hadn’t passed us. Maybe, but not with the child he now had in tow. The boy was just stepping away from a low headstone he had been examining closely. He was wiry and a few inches taller than EV, with an equine nose upon which rested a very unchildlike pair of square-framed, polarized glasses. He was staring at me from over their rims. “Ah,” I said brightly, tugging EV away from her act of trespassing. “It’s such beautiful weather.” I decided that this was vague enough that it couldn’t possible offend them if they had been visiting the grave of a loved one. “It is!” the man replied cheerily as the boy moved to idle by his side. “My grandson is showing his ol’ pops around the place.” Which immediately made no sense to me because pops had just been wandering around by himself without the grandson a moment ago. How did he have enough time to circle back, retrieve the boy, circle ahead of us, and examine tombstones? But, I have a certain way that I talk to children like little people adopted from my own years of precocity, and I already launched into it. He gestured and I followed his finger while he continued to chatter. The house he was pointing to seemed like another one of the dilapidated cottages on the grounds – not one I’d expect a young boy to live, although I supposed a groundskeeper could live there with a little family. As I listened to him speak I noticed that EV had taken leave of me and was continuing to walk a few steps past where we had stopped to chat with each other. The boy was still speaking, but the man interrupted him. I took my customary pause to see if EV would respond, but she made no motion to turn around. “A few weeks shy of three,” I answered, drifting slightly in her direction. “How old are you?” I said, indicating the boy with my chin. “Oh, he’s three, too,” the man answered. I squinted down at the boy. He did not look or sound three. He was articulate and self-possessed. He was dressed like a slightly miniature seven or eight year old who had just discovered he could stand out from his peers with a slight sartorial tweak. He continued to watch me over the rims of his tinted square glasses in a distinctly un-three-year-old like way. EV was now three body-lengths from me along the road. There had been no cars in sight so far, I knew that distance to be the point where I cannot wind sprint to scoop her up in less than a second, so I hurried to catch up with her. Maybe I called out, “sorry,” over my shoulder. I caught up with EV and put my arm around her shoulders. She giggled up at me. “EV, you were running away from our new friends,” I glanced back at the man, waving jauntily at EV, and the boy, as still as a portrait. “That little boy lives here.” She paid me no mind and kept walking up the road. It wasn’t until much later, in describing our encounter to E over dinner, that I realized EV never once acknowledged the pair of them – not with a glance or with her typical shy toddler routine of standing slightly behind my leg. I don’t think she ever saw them.